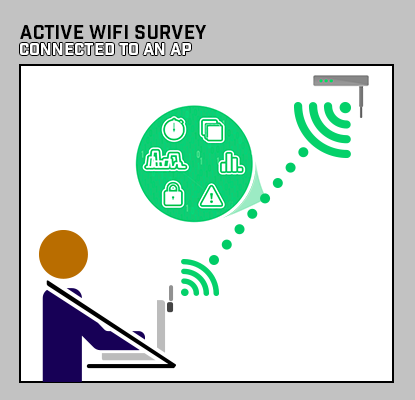 An active WiFi survey is when a surveying device is connected to the WiFi network and records signal measurements based on the performance of the connection. Active surveys are used to troubleshoot WiFi networks. This type of survey also allows for various other metrics to be measured, such as ping round-trip-time (RTT), throughput using iPerf/iPerf2/iPerf3, and Internet upload/downloads. 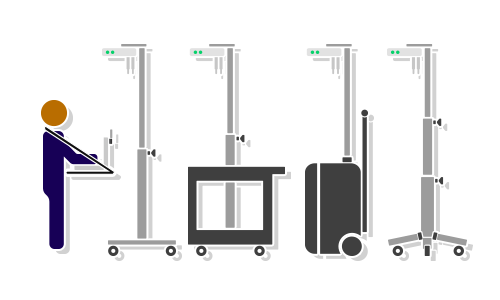 As part of our WiFi/wireless design process we typically conduct an onsite RF survey to understand the RF characteristics of the location and to validate our design for access point locations. This setup involves measurement/survey software running on a laptop or tablet that can collect information about WiFi and non WiFi devices in the environment. This data is compared with WiFi signals from a temporary access point deployed for this survey process positioned at locations we believe would meet the requirements of the deployment.